You might be wondering what an article about baking ingredients is doing on a survival site. Is this really something people will have to worry about after a disaster? Well, imagine this: The power has been out for several days, social unrest is at an all time high, and you’ve decided to bug in until the worst is over. Your family could use a morale boost, so one morning you decide to make pancakes for breakfast. Baking powder only lasts 18 months at best, and only 3 to 6 months once you’ve opened the container. If you try to use expired baking powder, your pancakes won’t be fully at all. If you’re not sure how old your baking powder is, you can test it by adding a teaspoon to 1/3 cup of hot water. If it foams, it’s still good. If not, you’ll have to find a substitute. Not a problem. For every teaspoon of baking powder you need, just combine 1/4 teaspoon of baking soda with 1/2 teaspoon of cream of tartar. Those two ingredients will last indefinitely if stored properly, which means you don’t even need to stock up on baking powder. 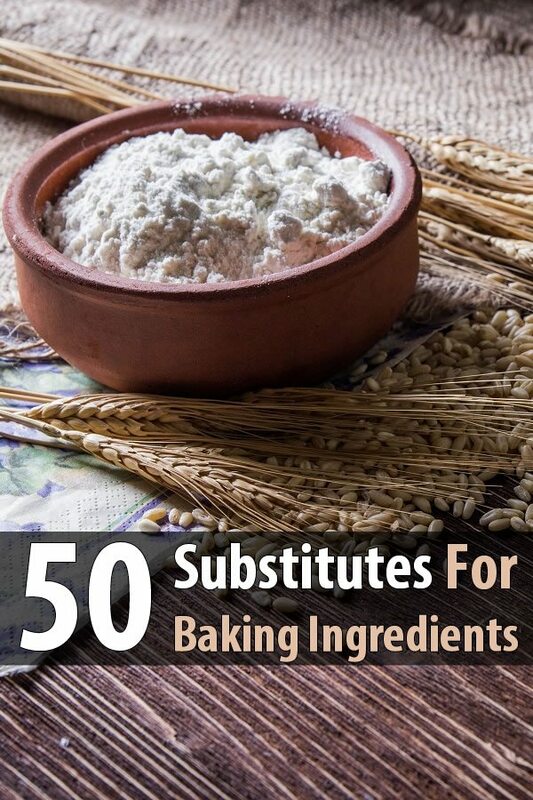 There are many other situations where a baking substitute might be necessary. If you plan on baking after a disaster, familiarize yourself with the following list. 1. Baking powder: 1 teaspoon = 1/4 teaspoon of baking soda and 1/2 teaspoon of cream of tartar. 2. Baking soda: 1 teaspoon = 1 teaspoon of potassium bicarbonate and 1/3 teaspoon of salt. 3. Beer: 1 can = 1 cup of chicken broth. 4. Breadcrumbs: 1 cup = 1 cup of cracker crumbs, corn flake crumbs, or rolled oats. 5. Broth: 1 cup = 1 bouillon cube and 1 cup of boiling water. 6. Brown sugar: 1 cup = 1 cup of white sugar and 1/4 cup of molasses and remove 1/4 cup of liquid from recipe. 7. Butter (unsalted): 1 cup = 1 cup of shortening, lard, or vegetable oil. 8. Butter (salted): 1 cup = 1 cup of shortening, lard, or vegetable oil and 1/2 teaspoon of salt. 9. Buttermilk: 1 cup = 1 tablespoon of lemon juice or vinegar and 1 cup of milk. 10. Cake flour: 1 cup = 7/8 cup of all-purpose flour and 2 tablespoons of cornstarch. 11. Catsup: 1 cup = 1 cup of tomato sauce, 1/2 cup of sugar and 2 tablespoons of vinegar. 12. Chocolate (unsweetened): 1 ounce = 3 tablespoons of natural cocoa powder and 1 tablespoon of shortening, vegetable oil or unsalted butter. 13. Chocolate (sweetened): 1 ounce = 3 tablespoons of natural cocoa powder, 1 tablespoon of shortening, vegetable oil or unsalted butter, and 1 tablespoon of sugar. 14. Chocolate chips: 1 ounce = 1 ounce of unsweetened chocolate and 1 tablespoon of sugar. 15. Cocoa powder: 3 tablespoons = 1 ounce of unsweetened chocolate, and remove 1 tablespoon of fat from the recipe. 16. Corn syrup (dark): 1 cup = 1 cup of maple syrup or 3/4 cup of light corn syrup and 1/4 cup of light molasses. 17. Corn syrup (light): 1 cup = 1 cup of honey or 1 cup of granulated white sugar and 1/4 cup of water. 18. Cornstarch: 1 tablespoon = 3 tablespoons of all-purpose flour. 19. Cracker crumbs: 1 cup = 1 1/4 cups of breadcrumbs. 20. Cream of tartar: 1 teaspoon = 2 teaspoons of white vinegar or lemon juice. 21. Cream (half-and-half): 1 cup = 7/8 cup of whole milk and 2 tablespoons of unsalted butter. 22. Cream (heavy): 1 cup = 2/3 cup of whole milk and 1/3 cup of unsalted butter. 23. Cream cheese: 1 cup = 1/2 cup of plain yogurt and 1/2 cup of ricotta cheese. 24. Egg: 1 egg = 1/2 teaspoon of baking powder mixed with either half a pureed banana or 1/3 cup of applesauce. 25. Flour (self-rising): 1 cup = 1 cup of all-purpose flour, 1 1/2 teaspoons of baking powder and 1/4 teaspoon of salt. 26. Flour (whole wheat): 1 cup = 7/8 cup of all-purpose flour and 2 tablespoons of wheat germ. 27. Garlic: 1 clove = 1/8 teaspoon of garlic powder. 28. Ghee: 1 tablespoon = 1 tablespoon of butter or vegetable oil. 29. Honey: 1 cup = 1 cup of corn syrup, or 1 1/4 cup of sugar and 1/4 cup of water. 30. Hot sauce: 1 teaspoon = 1 teaspoon of vinegar and 3/4 teaspoon of cayenne pepper. 31. Italian seasoning: 1 tablespoon = 2 teaspoons of parsley, 1 teaspoon of basil, and 1/2 teaspoon of oregano. 32. Lard: 1 cup = 1 cup of shortening or 1 cup of vegetable oil. 33.Lemon juice: 1 teaspoon = 1 teaspoon of white wine or 1/2 teaspoon of vinegar. 34.Marshmallow cream: 1 ounce = 3 melted marshmallows. 35. Mayonnaise: 1 cup = 1 cup of yogurt, sour cream, or pureed cottage cheese. 36. Milk (evaporated whole): 1 cup = 1 cup of half-and-half. 37. Milk (sweet condensed): 14 ounce can = 1 cup instant non-fat dry milk, 2/3 cup of sugar, 1/2 cup of boiling water, and 3 tablespoons of unsalted butter. 38. Milk (whole): 1 cup = 1 cup of reconstituted dry milk and 2 tablespoons of unsalted butter. 39. Molasses: 1 cup = 1 cup of dark corn syrup, or 3/4 cup of brown sugar and 1 teaspoon cream of tartar. 40. Mustard: 1 tablespoon = 1 tablespoon of dried mustard, 1 teaspoon of sugar, 1 teaspoon of vinegar, and 1 teaspoon of water. 41. Rice: 1 cup = 1 cup of brown rice or 1 cup of barley. 42. Ricotta cheese: 1 cup = 1 cup of cottage cheese. 43. Shortening: 1 cup = 7/8 cup of lard or 1 1/8 cups of unsalted butter. 44. Sour cream: 1 cup = 1 cup of plain yogurt, or 1 cup of whole milk mixed with a tablespoon of lemon juice or vinegar. 45. Soy sauce: 1/2 cup = 1/4 cup of Worcestershire sauce and 1 tablespoon of water. 46. Tapioca: 1 tablespoon = 1 1/2 tablespoons of flour. 47. Tomato sauce: 1 cup = 1/2 cup of tomato paste and 1/2 cup of water. 48. Vegetable oil: 1 cup = 1 cup of apple sauce (for baking) or 1 cup of shortening (for frying). 49. Vinegar: 1/2 cup = 1/2 cup of white wine or 2/3 cup of lemon juice. 50. Yogurt, (plain): 1 cup = 1 cup of sour cream or buttermilk.